Accommodates 2 people. 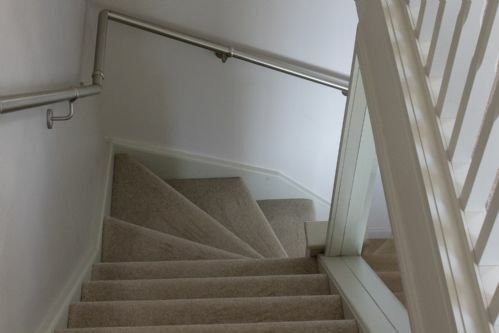 It has a king size ensuite bedroom on the upper level and an open plan lounge and dining area downstairs.It has a fully fitted Kitchen and an additional Toilet which is on ground floor level. 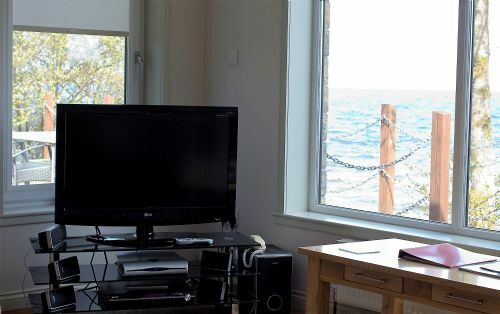 All rooms have excellent loch views and are equipped with satellite TV, telephone and central heating.It has a water side decked area with patio furniture. With fantastic views across the loch Pier Cottage is perfectly situated with its own beach offering privacy and seclusion ideal for honeymooners, romantic breaks and chilling out time. Beautiful peaceful location. Perfect for getting away from it all. Lovely cottage, very clean. Staff extremely helpful and friendly. Would highly recommended. Beautiful place from which to explore the loch! We had a fantastic stay at Pier Cottage. The cottage itself was easy to get to with superb help from the team to make our stay relaxing and comfortable. The views are unbelievable and it’s only a short stroll to Duck Bay where we had a delicious meal or if you wander a bit further you reach Balloch with some lovely pubs and views from the castle. Killin was beautiful as well and worth a visit if you have a car. We will be back, thank you for a wonderful holiday! Our stay at the cottage was very good initially we got a little lost but with one call to Wendy all sorted. Cottage was as expected lovely view of loch, sky TV and wifi which was sometimes a little slow but still was fine for us. So peaceful abs quiet just what we needed and I would definitely return. Excellent, but couple points to note. We loved our stay & would happily have stayed longer. The cottage is small but has everything you could need. Views across the Loch are outstanding, but how can you go wrong in 1 of the most beautiful parts of the world. My only issue is that; when you look at pics online of the Auchenglish properties, they seem to deliberately disguise the fact that 2, including pier, plus the office, are attached. I wonder if the owners residence is also in the attached building. Another 2 cottages are on the same wee strip of lochside land. If I was really wanting privacy then this situation, with the adjoining properties balcony overlooking pier cottages decked area, would bother me. Enjoyed our two nights break. Lodge is in an excellent location for touring . Being a stone throw away from an excellent restaurant also added to the attraction. The nay down side was the lighting out side the lodge it is very poor and someone could easily have a bad fall on the metal stairs and the decking ...this is one aspect that needs upgraded immediately. Other wise is a lovely venue. We have stayed at Auchenheglish Lodges over 10 times now and just love it. First time in Pier Cottage but was just lovely, great views and location as always. - Well equipped kitchen with decent appliances, including a separate clothes dryer. absolutely stunning, views were amazing and the room was clean and tidy, had everything you could have needed within the cottage. Would 100% recommend this place to anyone and will be staying again myself in the not to distant future! We’ve been here 10 times in nine years stayed in all waterside lodges , can’t beat it , we’ve booked again for April 2019, our 35th wedding anniversary, Taking the kayak and bikes again. Our stay was lovely, everything was there and ready, clean and tidy and a beautiful setting on the loch, Very relaxing. We had a wonderful week at this beautiful place. Really well appointed holiday home. The amazing view from the lounge was constantly changing and completely mesmerising. So many lovely places to visit in this area. We will certainly be back. Wonderful holiday, great location. Cottage was lovely we had a great time.Will definitely be returning next year. We enjoyed our stay at the lodge. Very comfortable would recommend to visit and will definately book again. Thank you to the lady at reception when I had my accident. The location is very good and it is wonderful to see the loch so close. The cottage is comfortable and well maintained. We are looking forward to revisiting as we enjoyed our stay so much. Second time here. Superb location, great views and very comfortable. Would not hesitate to recommend. Stayed at pier cottage....wow!....what an amazing place. The views are breathtaking, the cottage has everything you need, comfortable, private, spotlessly clean and cosy....didnt want to leave! If youre looking for a place to fully relax.....pier cottage is the place for you. Well worth the 300 plus miles and over 6 hours to get there! Myself and my wife have just spent 2 fantastic weeks at Pier Cottage. 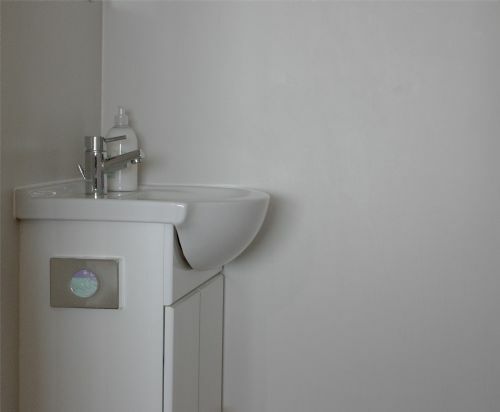 The cottage was extremely clean, comfortable and well equipped. A lot of thought has gone into making the most of the amazing view. The entire team at Auchenheglish have made our stay so very relaxing. All of the lodges are definitely worthy of their "luxury" status. Use Auchenheglish every time we stay in Loch Lomond and have never been disappointed. From the welcome and helpfulness of Liz to the quality and comfort of their accommodation, it makes a holiday to remember. We will definately continue to use Auchenheglish and can’t wait to return. This is our second stay at Pier Cottage during the winter months and it's just fantastic. Very warm and cozy to enjoy the picture window view from the comfy sofas. The cottage is modern and very well appointed but it really is all about the location. 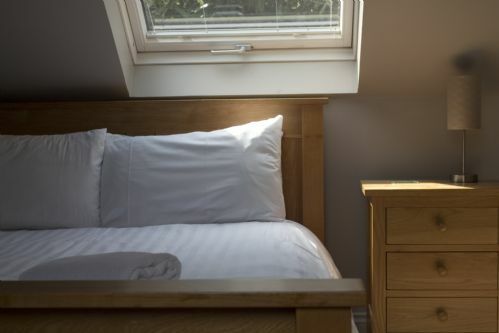 The layout is ideal for two people and the kitchen is very well equipped if you like cooking.Very comfortable bedroom with great views from the roof windows and a well appointed on-suite bathroom. 10 out 10 from me. This cottage is in an excellent location for getting out and about and seeing the sights of the National Park or if you prefer, just sit and gaze out of window and take in the breath taking scenery. My husband and I stayed recently at Pier Cottage. We were not disappointed , the cottage was very well appointed and equipped and very comfortable. The cottage was lovely and cosy , perfect for a winter break. The views from the lounge window were amazing. One morning we even had snow which added to the beauty of the view. Really enjoyed the peace and quiet and will definitely be back again. 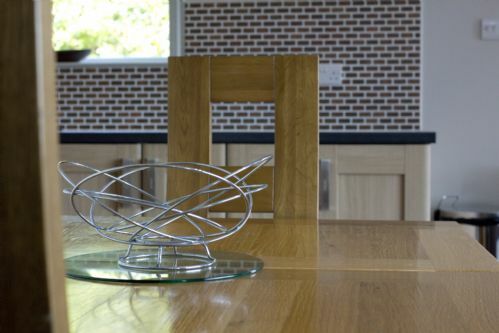 Pier Cottage provides the perfect getaway for those who love the stillness of Loch Lomond. 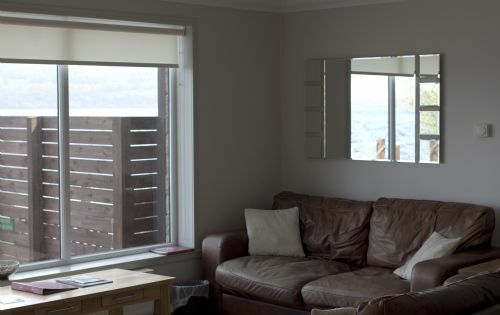 The cottage is very easy to find, totally private in a fantastic location on the shores of Loch Lomond, The accommodation is clean, spacey and airy and the view from the living room is wonderful. Great place, great location with a great view. Spend week with my wife there and we loved everything and every minute. We will be back for sure. Love Scotland, love Loch Lomond. Lovely cottage on the lock. Furniture a little tired looking and complete lack of shelving in bathroom/bedroom but a fabulous cottage and would highly recommend a stay here. Booked pier cottage on the recommendation of a friend, we were not disappointed the view from the lounge window is second to none. The cottage was clean and very comfortable we thoroughly enjoyed our stay. If you are feeling energetic a walk a up Ben lomond is recommended the views are stunning on a clear day, which we had. Fantastic location right on the Loch. Accomodation was superb, only wish we had, had a longer stay. Will definitely return in the future. I had a lovely relaxing stay at Peir cottage on the wonderful bonnie banks of Loch Lomond. Housekeeping was spotless and the lovely welcome pack was ideal. I was on my own and felt safe with the privacy and locked gates. A lovely wlcome on arrival . I would certainly recommend it. I can't even begin to tell you how much I enjoyed myself. It's a very peaceful and serene location. I will definitely be returning, again. We had a lovely few nights in the cottage and would happily stay again. We couldn't fault the property or the location. Definitely recommended. We have stayed in Auchenheglish properties before but this was our first time in Pier Cottage - fabulous! View is amazing, quality of the cottage is great and the location is ideal. 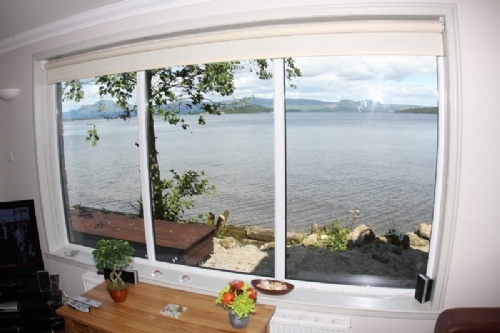 Cottage setting and loch views are stunning and cottage itself is fabulous. Everything we could possibly need was provided. With pubs/restaurants, scenic walks and small retail outlet all within walking distance we didn't even bother with the car. We had a lovely time and would definitely recommend and return. Thanks. We booked Pier Cottage, for a relaxing break away and it did not disappoint. The cottage had everything plus more than we needed and the view was breath taking. Hope to be back again soon. What a lovely and cosy place - right on the water with perfect sunsets and sunrise. We were so relaxed. Very helpful to have a washing machine, dryer and dishwasher. Very clean facilities. Thank you for the welcome pack it was much appreciated. Another faultless stay at Pier Cottage for our anniversary - a full week this time! We are already booked for next year as we find the property, location and the efforts of all the staff irresistible. It suits our needs perfectly. Amazing views - in a great location. The Cottage was very comfortable and finished to a high standard. We have already booked to come back again. Beautiful place to stay, very private. Views were spectacular. Very well appointed cottage. Ideal for two for a quiet relaxing break. Clean, comfortable & outstanding views the cottage is a little gem. Have stayed here on more than one occasion & although there were little signs of wear & tear I am already looking forward to my next visit as I am confident these will be addressed. I've been here to stay a few times. It's an excellent location and property to stay in at any time of year. Views across the water soothe and calm you. You'll benifit from trying this once in Your life. Go on treat yourself. We had again a wonderful stay in the Pier Cottage. This time we've spent 3 weeks and we've enjoyed every minute. We can't get tired of this lovely view across Loch Lomond. It's a wonderful location for a lot of trips to houses (Hill House) and gardens (Benmore) and of course into this beautiful countryside (Glencoe and Trossachs). We did a lot of hiking too. There are plenty of opportunities around this place. The cottage itself is well equipped. We've got frequently new towels and linen which was much appreciated. The only reason why I don't rate excellent throughout here is because we were a bit disappointed though that some few small things which have been worn out already last time we've been there, had not been fixed. But these little flaws won't hinder us from coming back. We love this place very much! welcome and everything is in order. The location is perfect and the view's are to die for. We hope to continue to visit Scotland and stay at Pier Cottage, our home away from home. Lovely and comfortable cottages. The view is outstanding! Our week at Pier Cottage was excellent. The accomodation provided us with everything we needed and we enjoyed returning to it after a busy day exploring the National Park. It provided us with an excellent base in a great location, we could easily access all parts of the area without having to travel to far. The cottage itself is well maintained, extremely clean and very cosy. The view across the Loch towards Ben Lomond is absolutely fantastic and we really enjoyed seeing all the activity on the Loch and the wildlife from the comfort of the garden. We were treated to a visiting tree creeper every morning and even saw an osprey! We easily found places to eat nearby from the cottage, including a lovely place in Luss just up the road and we enjoyed a meal at Cameron House which was in walking distance. Balloch is reasonably nice place with a few places to eat. The kitchen facilities in the cottage provided us with all we needed on the evenings we decided to cook. All in all, Pier Cottage is a great cottage, in a super location, with everything you need in the local area to have a brilliant holiday exploring Loch Lomond and the Trossachs. We have stayed in Pier Cottage 5 times now, and it never fails to work its magic on us. 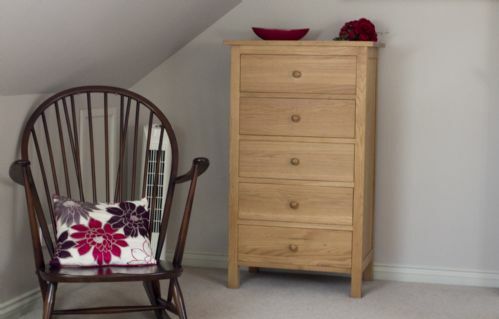 The cottage itself is a good size for 2, with plenty of space and lovely furnishings and fittings. But it's the position so close to the loch, and the amazing view, that really has us hooked. The moment we walk in the door all our worries and stresses fall away and we just give ourselves up to the most relaxing week ever. We find it endlessly fascinating to watch the comings and goings of the local wildlife, which this year included a swan family of 6 little ones - fantastic. A big personal thank you must go to Liz in the office who was so helpful and kind both before we arrived and during our stay. The view was wonderful from the window with ever changing colours and skies - no need for tv! Pier cottage was immaculate with everything you need and more. Although it was situated very close to the busy road and traffic could be heard the cottage is a short drive to beautiful countryside to get away from it all. Despite the rain we had a delightful holiday. Superb accomodation - planned to do much but did very little because the location and facilities seduced us into total chill out! Weather perfect, even the midges were friendly!! Once again, a lovely time had, this time in Pier Cottage, on the banks quite literally of Loch Lomond. 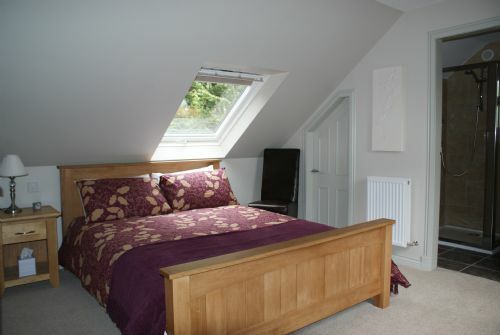 Tranquil cottage for two, great views and superbly equipped for holiday or business pleasure. Offers great privacy, and good location to usecas a base. Pleasurable experience. Lovely staff, and offers a wonderful opportunity to see, and participate on what loch Lomond can offer. Car is essential for all those lovely trips, long or short that you can do from.the cottage. Fabulous location peaceful and the good weather made it a perfect weekend away. Cottage was very clean and everything there that you would need even the wine. Its the view that is the cherry on the top. The cottage is so well equipped. You would want for nothing. We loved every minute we stayed there. The cottage is comfortable and relaxing. Great to get up in the morning and look out over the loch. Great to come back to and see the scenery change with the light across the water and the hills. The location is just perfect. This was our second trip to stay in one of the lodges that Auchenheglish offer and I must say we weren't disappointed! All the lodges are finished to an extremely high standard and the customer service is second to none! Any concerns or issues we had were dealt with professionally and quickly. The view from Pier Cottage is absolutely breathtaking and we will definitely return for another stay. If anyone is looking for a peaceful romantic getaway to recharge your batteries this is the place to do it! A lovely Loch-side cottage in beautiful surroundings with wonderful views across and around the Loch. Good weather was a bonus. The location is ideal for touring around the area. The cottage has everything needed, and the welcome pack provided meant no immediate rush to the shops- allowing more time to relax. The views from the cottage are simply stunning. The accommodation is very comfy and has great facilities. We had a lovely stay and would definitely recommend it. Stayed at the cottage with my new bride 2 days after our wedding...the place is stunning!! Great view, great place....all the facilities you need....amazing!!!! Liz was so helpful and warm in welcoming us. Definitely coming back!!! Thank you. I can't recommend this cottage highly enough. The location was perfect and even though the weather wasn't great we had a wonderful relaxing time. We will definitely be back. Everything about my experience at pier cottage surpassed my expectations . The whole experience was fantastic , from my first contact at making my reservation through to handing back the keys on departure. Liz was very helpful and friendly and the cottage was absolutely spotless throughout. The view across the loch is awe inspiring , it surely must rate in the top 10 most beautiful and peaceful places on the planet . I would recommend a meal at Duck bay , the food is very good and the staff are immaculate . Altogether I am very happy and I would definitely return in the future . We absolutely loved the location and the lodge was perfect for our needs. 3 nights of bliss in this cortège, amazing views onto the loch and the accommodation was first class. I would recommend this place to stay as it was brilliant and I will be back for sure. A lovely place to get away from it all without really leaving civilization. Peaceful, quiet, private and yet literally just off the motorway. We were sad to leave and would return in a heartbeat! Pier cottage is a beautiful waterfront hideaway, perfect for getting away from it all and enjoying the superb views. This is our second visit to the cottages, my girlfriend and I first stayed at the Heron and then spent Christmas week in the Pier cottage. Got to admit everything about out stay was just amazing and magical, from waking up to the views over Loch Lomand each morning to watching it go dark. A very comfortable cottage with everything you need in the perfect location for Christmas. We adopted the two swans who visited us every meal time and were a joy to see every day, they are certainly two little characters! Thank you for an amazing time. cant wait to go back. We came to Aucheneglish cottages for a bit of peace and quiet and a break from London life. We flew to Glasgow airport and after picking up a rental car, we arrived in Arden in less than half an hour. The cottage we stayed in - Pier Cottage - really is right on the banks of Loch Lomond. It was clean, well equipped and with the most magnificent views of the Loch and Ben Lomond. We holidayed in October and found it to be a splendid time of year to be in the Trossachs, no midges that would be ever present in the Summer and fewer people too, meaning we had the peace and quiet we craved. I couldn't recommend these cottages more highly - or perhaps I shouldn't, and just keep it as a secret. We booked for two nights and on arrival wished we could have booked more. Simply stunning and exactly what we where looking for. We intend to be back for more next year. Fully recommend the cottage. Once again our stay at the Pier Cottage was as special as always. We always return for our anniversary getaway and are never disappointed. The lodge is always immaculate, thanks to Liz, Wendy and the staff. We are always made welcome, and Liz has become a firm friend over the years we have been staying at the lodge. Needless to say, we have already booked for next year and are looking forward to it already. We can't wait! This was our second visit to Pier Cottage every bit as enjoyable as the first and certainly will not be our last.The view from this property is stunning,tranquil,and so relaxing would certainly recommend it. We returned to Auchenheglish Lodges after 10 years and we loved it as much as we did the first time. 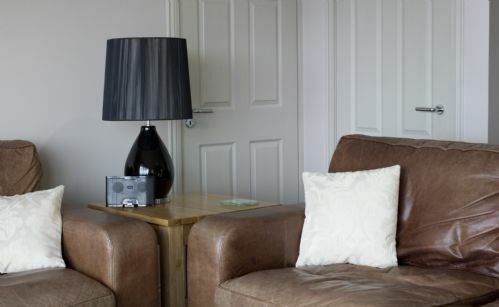 The Pier Cottage is a lovely apartment for 2 people. 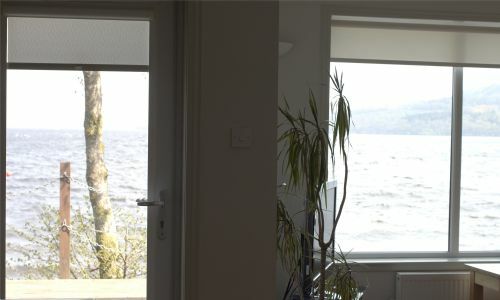 It offers enough space, a well equipped kitchen and best of all the most beautiful view you can get at the bonnie bonnie banks of Loch Lomond. We often just sat on the sofa with a tea and admired the view across the loch and the beautiful line of hills from Conic Hill to Ben Lomond. It's a perfect location for a lot of trips, e.g. to Stirling, or for hiking. The service and friendliness of the staff is just outstanding. We will sure be back and we will definitely not wait another 10 years. fantastic location and a beautiful cottage with views that are breath taking the staff are very friendly have already booked again for next year can't wait. We had an amazing stay at Pier Cottage. Peaceful after city life. We hope to return next year and would highly recommend your lodges. Maybe next year we may go for the bigger lodge and bring the whole family. Scenery magnificent kayaking on the loch for 8 hours was the highlight of the holiday. We intend to do it again. 5 Star accommodation. Totally amazing cottage. 5 star quality in every way.. The views were breathtaking from the cottage. The loch was 10 feet from my window.. Cottage was totally modernised and exceptionally clean. The staff went out of their way to be helpful and friendly.. Thank you so much. I will be returning soon for solitude. Had a abosolutely fantastic week at Pier Cottage. Even the weather was fairly kind to us! Spotless well equipped accomodation, very private and well secured. We spent more time in the cottage than out of it as the views are amazing and ever changing. Plenty of places to visit and eat nearby when we did venture out. Liz was lovely and very helpful with any queries we had. Nearby Balloch is within easy reach for food supplies and eating out. The only (very minor) criticism we had was a lack of space in the cupboards for food storage when self catering. We ended up using the kitchen counter tops to store the boxes on, but as I said very minor and something we could live with. Loved feeding the very friendly ducks and watching the seaplanes and boats come and go. We will definitely consider a return visit to this or one of the other cottages if holidaying in the area again in the future. Can highly recommend to anyone wanting a relaxing chilled out break from everyday life! A truly stunning cottage in a location that can't be bettered. Even when the weather isn't so good, you're mesmerised by the view out over the loch. Every need is catered for. It's warm, peaceful and cosy! Was going to a wedding at Duck Bay and we decided to stay here the night before the wedding and the night of it. The lodge was lovely and only a 10 minute walk from Duck Bay, also handy for The Cruin and Cameron House. 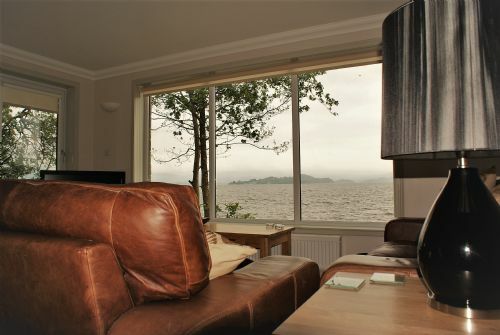 It was clean with a well kitted out kitchen and stunning views across Loch Lomond. Already recommended it to friends. We had a wonderful three night break this April at Pier Cottage. The staff we very helpful. 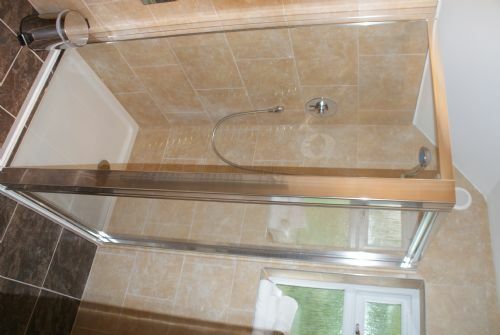 The cottage was very generously proportioned for a one bedroomed property. What fantastic views! They changed daily. The ducks, geese and swans were very friendly! We spent a lovely day driving to Oban which was less than two hours away. We fell in love with Pier Cottage and never tired of standing on the decking to look at the views. We had a perfect three nights at Pier Cottage. Me and my girlfriend were blown away by the view - the pictures on the website just don't prepare you for the actual thing. The cottage itself was comfy, clean, and the kitchen was stocked with more things that we could ever possibly use. This is lovely modern holiday home surrounded by beautiful, peaceful scenery. We will definitely return! We have stayed at most of the lodges but the Pier is now our favourite. It is just a perfect location for my wife and I for our short breaks. It is the perfect getaway, totally relaxing and we would not change anything about 'oor wee lodge'. Liz, Wendy and all the team provide the perfect service to make our stay special. We just love the place. We will be back again in November for our anniversary break, and will also book again for our birthdays next year. We couldn't fault Pier Cottage. The location right on the water was fantastic and the facilities were modern and clean. Not far from Duck Bay Marina and Cameron House. Lots to do in the local area but we would recommend taking a car. We will return. Stayed in hotels in this area. First time tried pier cottage. I will return and will recommend. It's got all you can want for and more. Views are stunning, staff helpful and polite. Cottage modern and high tech, Sky, wifi, iPod docking station. Plenty books DVDs and bbq. 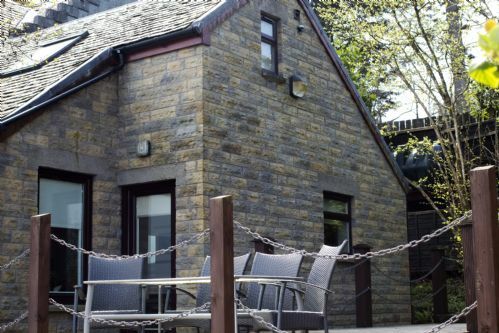 we are going back in May - as always you get fantastic service with Auchenheglish Lodges - Liz in the office is always ready to help and we cannot ask for more in the way of customer service. The lodges are always presented to the highest standards and the views are to die for - we have been using them for holidays for many years now and have stayed in many of their cottages and never been disappointed with the whole experience. This was our 25th anniversary, we wanted a relaxing romantic break, and we had that in heaps. From the Ducks waking us up on a morning for their breakfast, to the fabulous views over the Lake, and the star gazing from the loft bedroom, there was so much to like, it was almost magical. We had such a lovely time, and will make this our anniversary break every year. An absolutely fantastic view from an amazing little cottage. Perfect escape for my new wife and I. The staff were so very helpful and friendly. On a scale of 1-10 it's a definite 12. Thank you for such a great stay, had friends stay in 5 other cottages on sight and they were all just a impressed. We spent 3 nights at this wonderful cottage. 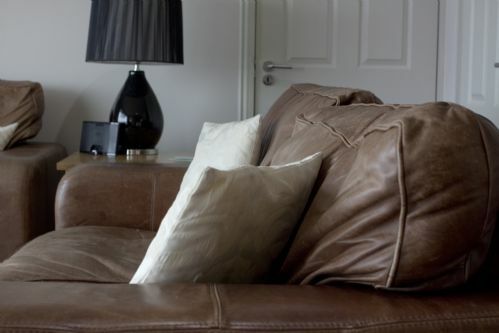 The cottage is extremely well furnished with two huge leather couches that you just sink into whilst gazing out at the glorious views of Loch Lomond. There is a large decking area to the side of the cottage that is totally private where we spent our time feeding the various ducks, swans and birds. The interior of the cottage has been very well designed, full sky tv package and very cosy. The kitchen has everything that you need at your fingertips. 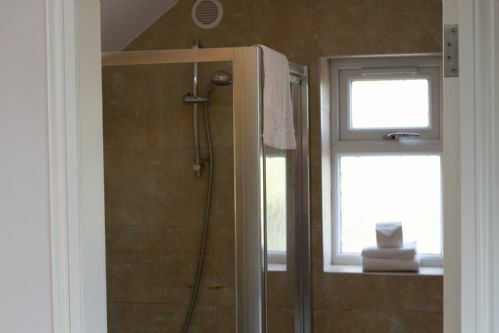 Upstairs is the really large bedroom with a very comfortable bed and en-suite bathroom with a powerful shower, the bedroom has a lovely view of the loch too. You are only a 10 minute walk to Duck Bay Marina which has a great restaurant. The cottage is really fantastic and booking was easy. The owners were really helpful and very quick to respond to any enquiries. I would definately recommend this lovely cottage and we will definately be returning. The cottage is an amazing place to stay, stunning view and lovely cottage in perfect location. I still miss being there and so hope to return in the future. This is our second time at this group of cottages and certainly lived up to all our expectations. Fantastic view across the loch. Cottage appointed well and even the weather was good. This was our fifth visit here and we just love it . It's the right place for chilling out, the scenery is fantastic. Lovely restaurant ten minutes walking distance and Luss, a lovely little village , as are the auchenheglish lodges, on the banks of Loch Lomond. First class accomodation in an excellent location and friendly staff. we would certainly stay at pier cottage again and have already recommended to friends. Our stay for 2 weeks at Pier Cottages have been a wonderfull experience. The location was/is stunning and there is loads to do in the surrounding erea. Missed contact with the owner though, reception was often closed during the times it should have been open but that wasn't a big issue. We enjoyed our stay and would like to recommend this to everyone who would like to see Loch Lomond in all its full glory. Top marks for cleanliness , helpfulness and friendliness of staff (Liz) as well as location and facilities. No midges either!!? This was the 3rd time we had stayed at the cottages and the 2nd time in Pier. Nothing is too much trouble for the staff to enable you to enjoy your holiday. The cottage is spotlessly clean, the bedding and other linen are good quality and changed within the week. The views are stunning, walks are on the doorstep and it's so relaxing. The welcome pack of food is a wonderful idea and a brilliant start. Liz is such a lovely person who makes sure everything is perfect for the stay - the other staff are also so friendly. Excellent, highly recommended. An excellent week, lovely cottage with all the requirements, the only thing I would like to say was the condition of the outside area and decking, the decking needs to be power washed to get it clean and rid of the black growth that is making it very slippery and dangerous, the edges of the steps should be marked, as the view is so good it is easy to be looking at the view and not notice you are stepping off one level onto a lower level, this happened to an older couple next door to us. Otherwise an excellent week at a great location. I would like to thank Liz Law and Liz Johnston for making our stay perfect. Pier Cottage was fantastic and the view was to die for. and they said if you stay two weeks you get a discount, we did not get a discount for staying two weeks! An amazing place to stay and had such a great time. The accomadation was excellent throughout and I felt instantly comfortable. The location and view is the real star though with amazing landscapes to take in from the living room or the patio. My only quible would be the photos should that there was a jetty which was in fact next door with no access - I found it a little misleading. But overall fantastic and I would definitely return. Lovely location, lacked attention to detail. 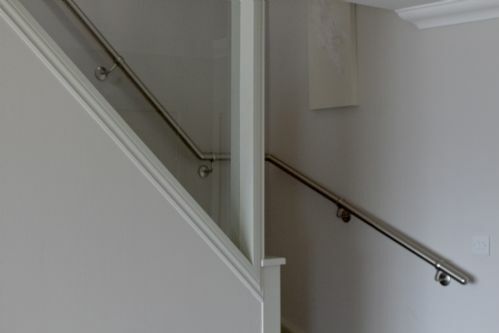 Whilst the location of Pier Cottage is unrivalled, and generally the cottage was in excellent condition, for what we paid I would have expected more attention to detail. The chopping board had seen better days and was basically unhygienic, the pepper mill did not work, the crockery and cutlery were a mixture of other sets, obviously filling in for previously brocken or missing items and some of the items in the 'welcome pack' were obviously purchased on a tight budget. The outside dining table also needed a good clean, although admittedly we did visit at the start of the summer season. Comfort wise, the two settees we rather old, and not particularly comfortable. In other properties in which we have stayed, there has been a welcome folder, with details of local attractions, walks and restaurant. In Pier Cottage there was an old ring binder on the coffee table, with details of how to switch on the TV/DVD etc, but no tourist information. Only towards the end of our stay did I find in a small drawer, various brochure left by previous occupants, but without any attempt to rationalise or organise. Whilst overall Pier Cottage is a most attractive property, in an idyllic location I would have expected more attention to detail in pricewise is a 5 star property. A great lodge with fantastic views over the loch, very comfortable furniture and excellent facilities. It's a comforting touch having the necessities waiting for you including bread, milk and jam especially if you've had a long journey as I did. Would definitely recommend to anyone thinking about staying here. The service from the staff was second to none. The cottage has everything you need for a self catering holiday. The views from the lounge are spectacular. Great value for money! Great weekend......location and scenery spectacular. The cottage is perfect and has all that you would require to make your stay enjoyable. We enjoyed ourselves so much we immediately booked again for next year! Excellent accommodation fantastic location outstanding views will definitely return for a future visit . Only sorry we had to return home at the end of the holiday.